Are you looking for the perfect party favor? Wedding or shower favor? I have a great suggestion. 24 Pack of Rock Candy. I received the black and white, there's 12 of each in the box. The black ones are cherry flavored and the white are sugar flavored. I think they are simple but can be elegant enough for a wedding , or sweet enough for a birthday party. They are versatile, can be used for any celebration or even just to snack on for those with a sweet tooth. 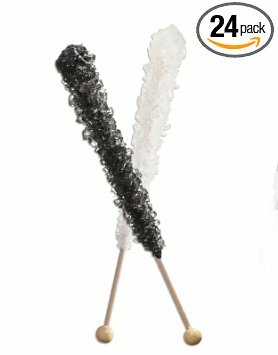 I love rock candy , something I remember from childhood. Each stick is 7" long, 4" of candy on each stick. They are individually wrapped and each bag is wrapped in bubble wrap and packed into a corrugated box to insure it comes to you unbroken. This company takes great care in packaging. I was quite impressed. My kids love this stuff and I agree I think it's something that would be great for a wedding or party! I love the black and white contrast, I decorated for a party years ago with this theme and it turned out so great!